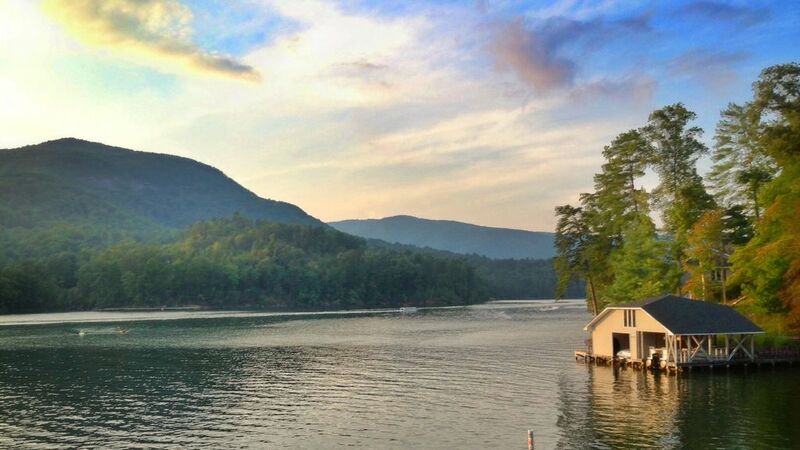 We BOAST the BEST WATERFRONT on Lake Lure ... Perfect for water lovers and water watchers. Our beautiful, newly constructed, boat house includes a big dock for rocking chairs both in or out of the sun... We have a water level dock that allows you to dangle your feet in the water just to get cooled down. For a full swim, our wide steps allow you to slowly enter the water.....or you can be adventursome and jump or dive off the end of each of our swim docks or really get out there by jumping off the top of our double slotted boat house.... Quite a thrill... No one has ever touched bottom by jumping off the top of our boat house. For sun lovers, bring your sunscreen cause our boat house deck is huge and gets full sun all day.... but when you get hot, all you have to do is jump off the top for a quick cool down. We supply ski belts, just to be safe... also blue rubberized floats and a peddle paddle boat for seeing the lake. For shade lovers, rock comfortably on our shade screened lakefront porch or sit on our outside fully shaded patio with hammock. You can still see all the action on the lake. In fact all of the rooms in our cottage have a beautiful view of Rumbling Bald Mountain and the lake. So we are nestled in the Blue Ridge Mountains of the Appalachian Chain, on the crystal clear, emerald waters of one of the most beautiful lakes in the world (National Geographic 1954), our lake front cottage's perfect location allows for active as well as 'laid back' vacationers during all seasons. With three, 18 hole golf courses in a three mile radius, municipal tennis courts, horseback riding, sight seeing, shopping, water sports, and wonderful restaurants within in a 20 minute drive, our guests can play till they drop. Swimming, skiing, and floating the lake's currents are wonderful activities May through September, after which you will need a wet-suit and a warm wood fire blazing in our fireplace. Be certain to bring hot chocolate! But most of all ENJOY IT ALL! Fireplace with wood burning stove, Air Conditioning, 2 Refrigerators(1 fridge on lower level for beverages) Ice Maker, Blender, Pets are allowed for an additional fee, We have a stock of 8 rubber floats and ski belts in varying sizes, We require our children to wear a ski belt in the water although they are excellent swimmers, Also we have a peddle paddle boat available for our guests.